. 2013. "Welcome". In Moultrie TA, RE Dorrington, AG Hill, K Hill, IM Timæus and B Zaba (eds). Tools for Demographic Estimation. Paris: International Union for the Scientific Study of Population. http://demographicestimation.iussp.org/content/welcome. Accessed 15/04/2019. 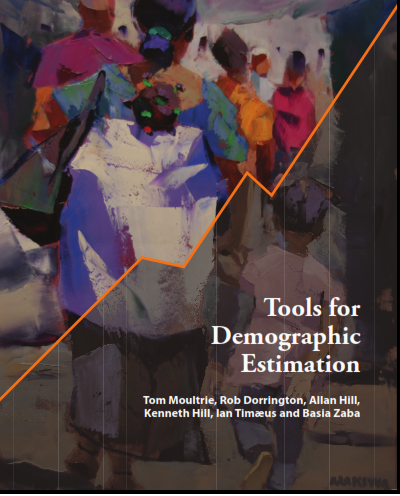 This site represents the major output arising from a joint IUSSP and UNFPA project to produce a single volume containing updated tools for demographic estimation from limited, deficient and defective data. The material here follows in a direct line of descent from Manual X and subsequent works (for example, the 2002 UN Manual of Adult Mortality Estimation). The principal aspect of this website is a series of (mostly) static webpages describing and documenting the tools and methods of demographic estimation from limited, deficient and defective data. The material is organised thematically first, and then by the kinds of data that may be available. Where appropriate, downloadable spreadsheets are provided that allow users to apply the methods to their own data. Forums are available to discuss and debate methods and results, and FAQs describe how to use the site in more detail. Links to both, as well as forms to contact us, are at the top right hand side of the screen. While all material on the site is freely available and accessible to anyone, only registered users are able to subscribe to changes on individual pages, or post comments on the fora or on pages. Registration is quick and automated. To register, click on the link at the top right. Click here, or on the image below, to download a PDF of the book.